At the age of 8, I began taking piano lessons but got tired of it after 7 years. Then I started to teach myself playing the guitar. I was 16 years old when I founded the rock cover band "Crash" with a few friends of mine. I played the guitar and sang for Crash. The band still exists and we've already done about 1.000 shows since then. 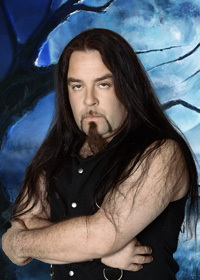 In 1997 I joined the power metal band "Powersurge" from Friedrichshafen, Germany as a singer. We released two demo albums (in 1998 and 2000). In 2004 I founded the independent band "New Turn Red" with a few musicians from Austria. New Turn Red split up after two years only. Helloween - Keeper of the Seven Keys Part I. and II.